A plush oasis in the city for those who appreciate the finer things in cocktail and cigar life, Le Connaisseur Shibuya is the place to unwind, enjoy, and simply savor in the Japanese capital. A plush oasis in the city for those who appreciate the finer things in cocktail and cigar life, Le Connaisseur Shibuya is the place to unwind, enjoy, and simply savor in the Japanese capital. 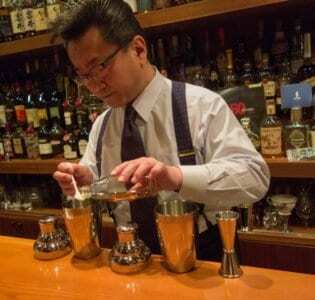 In the heart of Tokyo’s busier-than-bustling Shibuya, Le Connaisseur Shibuya is among a proud family of cigar bar & cafes, with this location truly one of their most impressive offerings. The decor of Le Connaisseur Shibuya sets an immediate tone upon entry that this is a bar for those who appreciate refinement, and have no problem paying a few more yen for it. Meticulously-laid dark wood tiled floors contrast strikingly with a sleek jet black bar to dazzle your eyes, while candlelight and walls adorned with colorful art work complete the ambiance. When it comes to settling on what to order, an extensive menu of classic cocktails, cigars, and food is beautifully presented. Home to an entire climate-controlled room that holds over 100 cigars, the staff at Le Connaisseur are more than happy to guide you through and recommend one just right for you if you so choose. That sort of care and attention to detail can also be found with the cocktails, as Le Connaisseur Shibuya’s drink card compliments the opulence of the cigars with drinks like mojitos, martinis, and Old Fashioneds, alongside gourmet bar food.